I took this book on vacation with me, thinking I might have some time for creative play. But all I did was read it. Reading must be my hobby of choice! I apologize to my relatives that I didn’t choose collecting instead so as to ease their gift-giving decisions. Maybe it’s a Midwestern thing, but you know that argument over “duck, duck, gray duck” or “duck, duck, goose” even among people who no longer recall the game to which the name refers? Well I’ve found a couple of other terms to fight over. Childcraft called tic-tac-toe “Tic-Tat-Toe.” I thought it was a typo, but they used the term several times. I’ve heard of “noughts and crosses” before, but never tic-tat-toe. Wikipedia states that another alternative name is “hugs and kisses.” That one I like. Tic-tat-toe sounds like a tattooing accident caused by a nervous artist missing your ankle. You know the old campfire standby of graham crackers, chocolate, and marshmallows? Well this book calls that a “somare.” What!? That makes no sense at all. Even Canadians call it a s’more. But since I’ve never liked them (‘smores, not Canadians), I was happy to see an alternative recipe that called for apple slices, a peppermint drop and toasted marshmallow. If I can find peppermint drops I might try it. I was very glad to see the rules for Button, Button, Who’s Got the Button. I have vivid memories of inserting what I thought of as my prayer palms into the closed palms of others during vacation Bible school, but I had been confused about who was It and who passed the button. Now I won’t be embarrassed in a group of Wii-deprived children sitting in a circle playing party games. I’ll know the proper rules for Passing the Ring, Pussycat’s Whiskers (like Pin the Tail), Forfeits (totally new to me) and Button, Button. Why is musical chairs also known as “Going to Jerusalem”? Neither Childcraft nor Wikipedia will spill the beans on that. Is it some slanderous secret? The world has really changed since these articles were written. No parent today is going to suggest that kids make eggnog for each other. Hey kids, it’s a salmonella party! And most parents won’t have these handy scraps lying about for their kids to use to make useful pieces of furniture: orange cases, nail kegs, piano boxes, barrels. And most parents (aside from my wonderful neighbors who let us dig Matchbox car roads in their side yard) won’t let their kids take over landscaping the backyard, although the authors do acknowledge that this should be a family decision. If the hobby you’ve chosen is playmaking and play acting, then this book has lots of ideas for you. It’s not just about playing house. There’s advice on how to select plays, actors, and music; how to create scenery and costumes; how to print and sell tickets; and how to prepare for playing your character. There are even suggestions for historical pageants and May festivals. Geez, my friends and I obviously had no ambition. We mostly just rode our bikes, sometimes took a pony out for a drive or ride, and argued over who got to get shot and die dramatically when we played cowboys and other cowboys. I should review the chapter “Cooking Up Fun.” I’m tall enough to use the stove so there are so many recipes I could try. I certainly never learned not to cook vegetables until they are limp. My mother loves them that way. Over two pages are devoted to making a roast beef birthday dinner for your father. I’m not sure if I can find the tartrate or phosphate baking powder for the oatmeal cookie dessert. Luckily my dad isn’t celebrating any more birthdays so I’m off the hook. He always seemed happy with just a pecan pie from Mom anyway. This entire volume just makes me feel like I never showed any creativity at all as a child. Or I’ve forgotten all the tricks I used to know, like how to make hollyhock flower dolls. I might have made a sock puppet, but I never made my own sweetheart apron or xylophone. 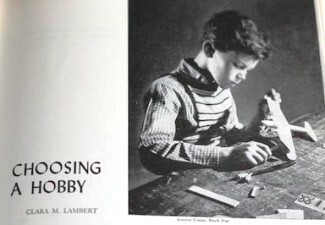 Were kids in the 40s and 50s just creative overachievers who are now getting their comeuppance with their lack of computer skills? 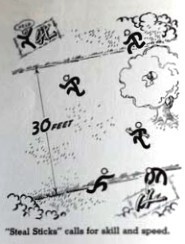 Previous volumes of Childcraft made me miss the silliness and freedom of childhood. This volume made me feel like a lazy dullard. I think this stuff was anachronistic when it was written. 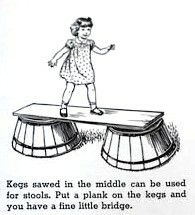 How many families had spare nail kegs laying around in the 1950’s? Also, that’s a lot of planning just to have fun. Why don’t they just teach kids how to write an operations order while they’re at it?